Walnut medal display cases, with brass hinges and hasps. Inside is a layer of foam, covered by dark green velvet material. 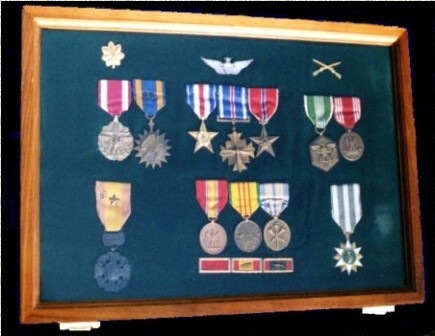 Medals do not have to be attached like in shadow box cases. When the lid is closed the medals are pressed into the foam. Most medals available. Case is $100.00 which includes shipping in the continental states.